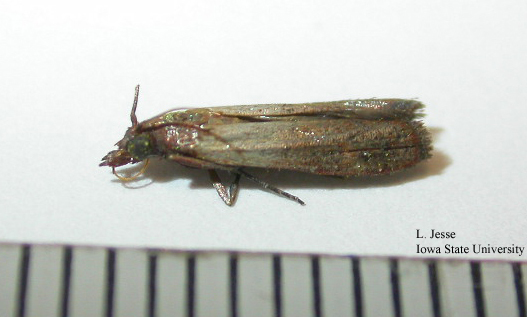 The Indian meal moth, Plodia interpunctella, is a very common insect pest in Iowa found in stored food products within the home and in stored grain on farms and at elevators. 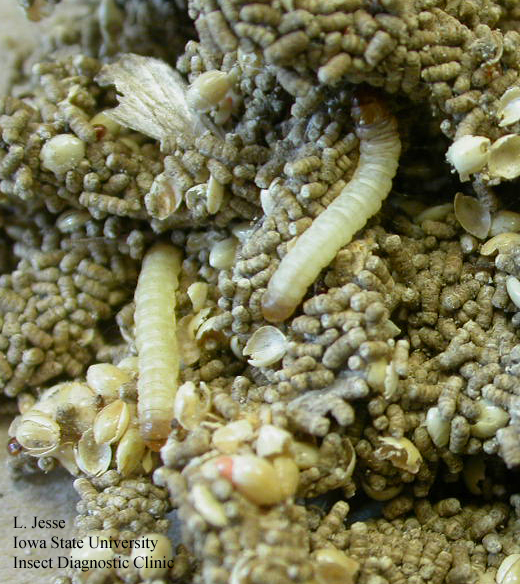 In the home, Indian meal moth larvae (or caterpillars) feed on any grain or grain product (flour, cornmeal, oatmeal, grits, etc. ), seeds (including bird seed and dried beans), nuts, chocolate, dried fruit (such as raisins), and so forth. These larvae often leave their food supply when they are ready to spin their cocoons and they may wander about in search of a suitable place to pupate. They are frequently found in unsuspected places because of this wandering behavior. Control of any stored food pest requires locating and eliminating infested item(s). All potentially infested foods should be checked. The insects may be in unopened boxes or containers. Infested items can be thrown away or salvaged by freezing for 1 week or heating in a 140 degree oven for 15 minutes. Empty and thoroughly vacuum clean cupboards or shelves holding infested items, paying particular attention to cracks and corners. Vacuum cleaning picks up hiding insects and spilled or infested material. Empty the vacuum cleaner or discard the vacuum cleaner bag after use to prevent reinfestation. Insecticide sprays are not recommended for controlling insects in stored food cupboards. Washing shelves with detergent, bleach, ammonia or disinfectants will not have any effect on insect pests. As a precaution against reinfestation, you may want to store susceptible foods in sealable glass, metal or heavy plastic containers or in the refrigerator or freezer until you are convinced the infestation is gone.